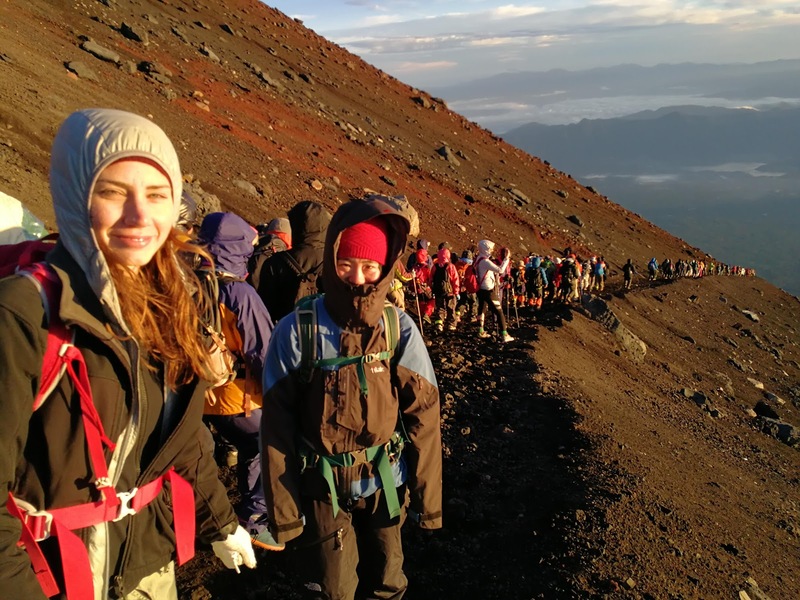 Watching the sunrise at Mt Fuji wasn’t the end of our trek. The destination was reached but the journey was far from over. We still had to climb down 1700 mtr. This was a different challenge altogether. From the summit of Mt. 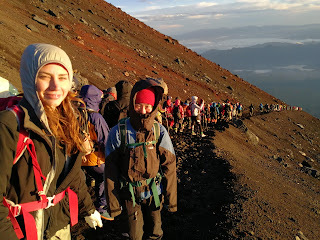 Fuji to our dormitory was simple 45 minute descend. The same queue that ascended was descending. But the mood was quite different. There was no competition, no rush. There were smiling faces, laughters. Row of colourful jackets looked pleasing to the eye. We reached the dormitory and had our breakfast. 6 AM. Little did we know that there was another challenge waiting for us. We packed and checked out of the dormitory. 7 AM. Wondering if there would be any other place whose check out time was 7 AM. By now the sun had started beating down. It was quite warm. Being a volcanic mountain, the top of Mt Fuji is quite barren, there are hardly any trees or any shade. But that wasn’t the biggest challenge. The biggest challenge was the slippery slopes. Its famous as sand run in Japan. Basically its a very steep slope with gravel, small pebbles and sandy soil in different proportions. This makes the slopes very slippery and dangerous. The possibility of slipping and falling down exists at every step. Initially, I was very careful. Making sure my trekking pole is nicely placed, making sure I was getting tight grip for every step, determined not to slip and fall. But later, I saw some trekkers literally running down the slopes. They were not scared of slipping and falling. In fact, they were using slipping down the slope to their advantage to cover some distance. Instead of controlling the slipping, they were anticipating and allowing the slipping and moving down very fast. They seemed to enjoy it too. After a bit, I threw caution to the wind and I tried that technique too. After a bit of trial and error, I started enjoying that too. I was coming down much faster and had lot of fun. Sure enough I was slipping and falling but was getting up with a smile and doing it all over again. My Vonfucius mind said - your glory is not in worrying about the fall but to get up every time you fall with a smile. We took long stops, refreshed ourselves with drinks, clicked pictures. With this worry-free technique descend was fun. Before we knew we were in the bus that took us back to parking lot. It was exactly 24 hours since we started our ascend. Out of those 24 hours we were trekking for almost 16-18 hours. We were carrying a back pack which was nearly 5 kg. The meals were paltry and basic to say the least. We were at the mercy of weather, for some time we felt hot, for rest of the time we shivered. The beds we slept were so narrow that you couldn’t move your hands without touching your neighbour. In short, we went thru all the hardships we could in last 24 hours. Yet when we got into the car we said - The fun is over, we have to go back to grind till next time buddy! So here we are back to the grind of air conditioned offices, swanky cars, plush sofas, flat screen TVs and high speed internet, pining for next escape to the mountains! After all the hustle bustle we reached the top. Since it is volcanic mountain, the top of Mt. Fuji is quite unusual. There is a crater in the center and one can walk around the crater. So all the thousands of climbers could be accommodated easily. Offcourse vantage positions towards eastern edge were taken first. My fellow trekkers were faster than me, they went and blocked one such vantage position for us. The stage was set for grand finale. Eastern skies were brightening up, wind was blowing hard. We were in luck as there were hardly any clouds in that direction. The tricky part of climbing all the way to watch sunrise or sunset is one small ill-positioned cloud can play the spoil sport. But the Universe was conspiring to show us the sunrise. It was very cold and blowing wind made it seem colder that what it was, so much so that it was difficult to take off gloves to click pictures or video. After initial hesitation, I flicked the gloves off and started taking pictures. After all, that was the reason, I had climbed 1,773 meter. Cloud formations were striking, blowing wind was changing their shapes every few minutes. The sun was rising behind the horizon, it was apparent from changing colours of clouds. My vocabulary is too limited to do justice to describe colour palette that changed every moment from dark to black to grey to shades of pink to shades of orange till finally it became light. As the light went up the landscape started getting clearer. There were magical moments that unfolded in front of our eyes as the landscape turned from 2D to 3D. The contours became clearer, the crescent shaped Kawaguchi lake separated itself from the dark background. The mountain range on the right was struggling to contain all the clouds which were trying to escape to the left and engulf the view. The magical moment came when the orange sphere appeared on the horizon. There was a loud cheer and sporadic claps, cameras clicked non-stop. Only when the Sun appeared on the horizon, we realised how fast the earth was moving. We could watch the sun only for a few seconds before it became it became so bright that we had to look away. We had toiled for it for last 10-12 hours and it lasted only for a few minutes. But it filled our hearts with joy and sense of fulfilment. The images we saw were imprinted on our minds. We took a lot of pictures but those could capture only minuscule version of what we saw. The images we carry in our minds can’t be replicated on any medium and the air that we breathed smelt different. Just as the sun appeared in the sky, wind slowed down, there was welcome warmth in the air. There were smiles all around. Tiredness had evaporated. Sense of accomplishment filled our hearts. We went around to take a look at the crater. It was huge, appeared bottomless from where we were standing. We were in awe with nature’s brute force which would have caused this eruption. I hear a popular phrase - he conquered so and so mountain or so and so peak. I don’t really agree with this phrase at all. Peaks, mountains and nature in general is not really conquerable. It is not meant to be conquered at all. 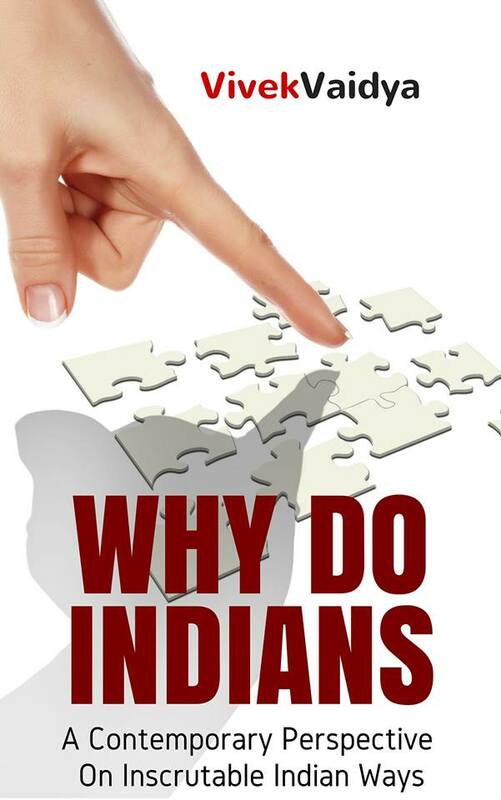 We are too inconsequential to make such preposterous claims. The only feelings I carry back from treks are gratitude, humility and feeling of oneness with the world. Destination was achieved but journey wasn’t over. We slowly climbed back to our refuge without speaking a word. Cosmic peace had filled our minds. 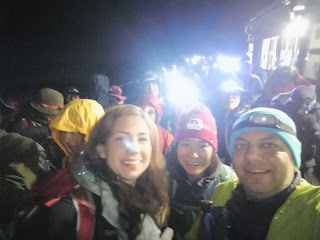 We got up next day morning at 1:30am and got ready to summit Mt. Fuji. The temperature outside was in single digits and very windy. So we had put on 3 layers - cotton T shirt, down jacket and windcheater, hand gloves, woolen cap and most importantly the head torch. Luckily we didn’t have to carry our sack. We were excited that long cherished dream was going to be realised. 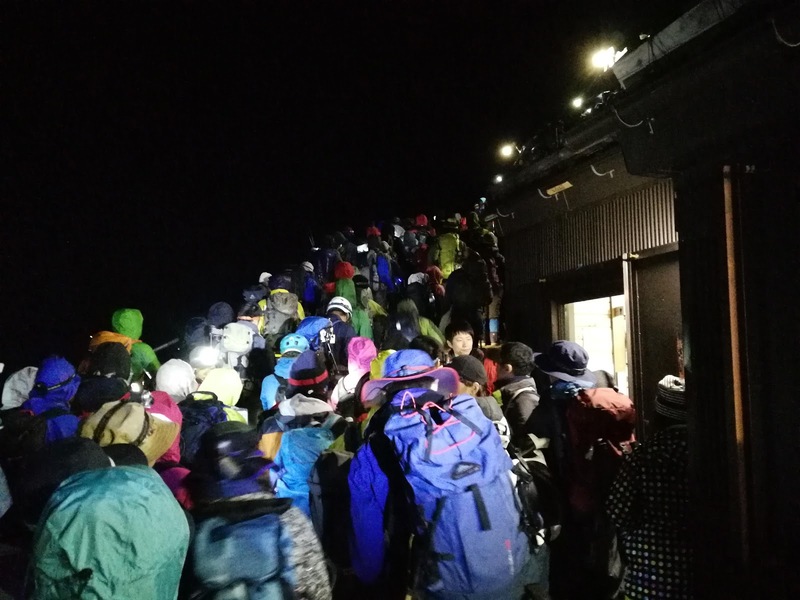 Got ready to step out but I couldn’t come out of my dormitory because there was a big queue outside... a big human traffic jam towards the summit. At first, I couldn’t believe it. Guess One has to see it to believe it. The queue was at least a 1 km long and building up. The headlights made it easy for us to track the queue. There were twinkling stars in the sky and headlight formations along the route to climb up. When you have closely packed group moving forward slowly, its difficult to chat. Only sound in the air was footsteps and trekking pole. The footsteps on gravel-soil road sound like chap chap. When the trekking pole hits the ground it sounds like chuk and when you pick it up it brushes against the light gravel and makes the chyak. We were moving slowly along three lanes. Carefully watching our footsteps, trying not to slip. Careful not to touch each other. Carefully planting our trekking poles in empty spaces. Wind is blowing hard making some of us shiver. We are thankful that we are in group. Those in side lanes breaking the wind speed and provide the warmth to others. Slowly we are getting used to the warmth created by the group. This is not a city road so the width is not uniform, in some places its narrow and wider in others. Its breaking the monotony of the group. Three lanes are merging into two or even one, testing our patience. As soon as we hit wider sections we start running. 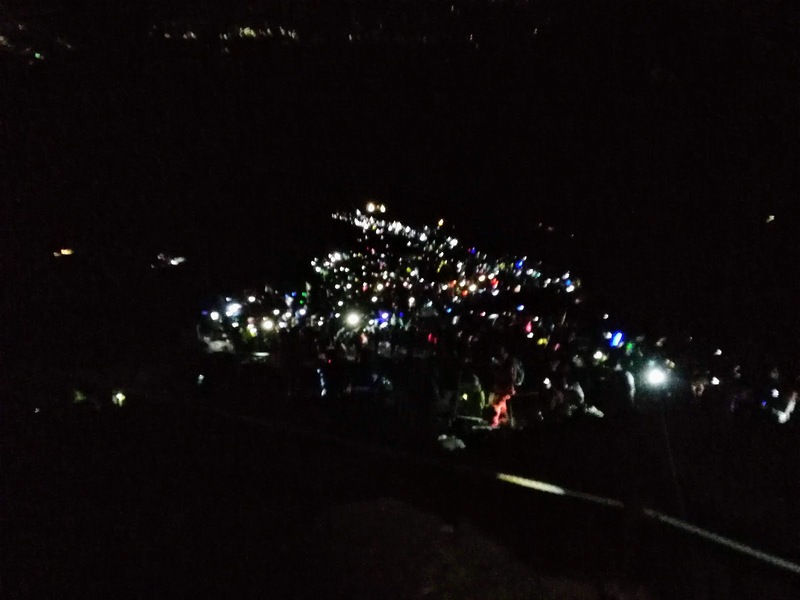 Its mad rush to reach the top before sunrise and secure a good viewing spot. Some impatient folks look beyond the safety ropes and figure out that there is still some space to climb up safely. So they cross over and take the short cuts. Some brave hearts follow them, others give condescending looks. The tempo is building, initial calmness is giving way to impatience. We hit rockpatch. Taller trekkers can still manage to climb, shorter ones use their hands to climb. Everyone is trying to avoid contact and worse stepping on hands. But mishaps are unavoidable. The initial oneness of group is slowly giving way to competition. Japanese volunteers are the most sincere. 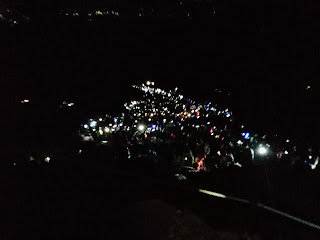 At this hour in those mountains, they are guiding the crowds with their fluorescent sticks while speaking continuously in Japanese. By now heartbeats are up and some are slowing down. Others want to overtake. Tempo is definitely in the next octave. We see some trekkers napping in sitting position on narrow spaces on the sides. They must be the trekkers who couldn’t secure the accommodation but decided to do hike anyway. Wind is getting stronger and sheets they are wearing are clearly inadequate to protect them from winds. But they are so tired that they are napping anyway. We feel pity for them, but only for a moment. We are in a rush. We have to reach the top before the sun. Bye folks, we feel sorry for you but sorry can’t stop. Just like in cities. 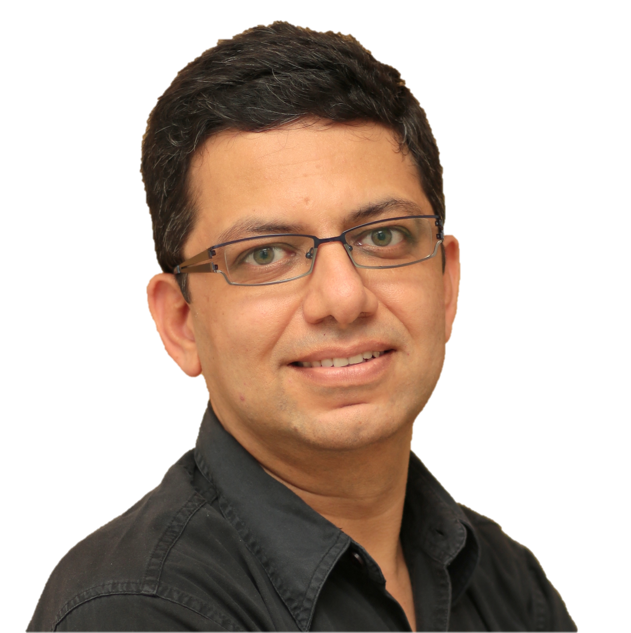 By now, all trekking courtesies and etiquettes are out of window. Oh take a look. The sky on eastern direction is brighter. We can easily spot the brightest point and imagine that the sun would rise from there. There are hardly any clouds on the horizon. Great! Twinkling stars are slowly disappearing, making way for the sun. We look at watch, still sometime before sunrise then look at the peak, the queue is slowly winding up Mt. Fuji. It looks like a fluorescent centipede moving slowly over the obstacle. We are not sure if we will reach the peak before sunrise. So rush!! Cut the line! Take the short cut! Avoid the hands! Oops Sorry! Don’t stop! Give way please! Where is my group? Never mind, they will find you, keep moving. I want to take a picture. No no. You will drop the camera. Move move move. Its rush hour at 1:30 AM @Mt. Fuji.